33 items found for "Show all items"
The aim of the PluriMobil project is to present a pedagogical device which will enable teachers to assist learners in benefiting, as much as possible, from the learning opportunities which they are offered by mobility – by integrating their intercultural and plurilingual encounters in a sustained learning process. The project ‘Fostering learning environments where modern languages flourish’ (EOL) aims to place languages right at the heart of education policy developments. It seeks through (and for) languages to strengthen the development both of social competences and competences for democratic citizenship. Based on European objectives to favour linguistic diversity and plurilingual and pluricultural education, the publication presents pilotedmaterials, activities and didactic tools. These are related to a theoretical framework which creates links between dominant languages and minority or regional languages in Europe and beyond. A teaching kit also offers a collection of practical examples and recommendations for policy-makers in the area of education. If the peoples of Europe are to live in harmony with their neighbours, if they are to communicate with and understand each other, the command of more than only one foreign language will be an increasingly important factor. For this reason both the Council of Europe and the European Union are demanding that their citizens should learn two foreign l anguages alongside their mother tongues. The Year of Languages 2001 was the stimulus for an investigation into how concepts of teaching and learning several languages could be developed and put into practice. The purpose of this book is not to give recipes. It is an attempt to investigate, theoretically as well as practically, certain important concepts in foreign language learning: dialogue, communication, intercultural awareness, language awareness, and the roles of teacher and learner. The aim of the Valeur was to raise awareness of the “additional” languages – those which are not national and regional languages – used in Europe, and collate information about the educational provision made for them. A flyer describes the educational, social and cognitive benefits of plurilingualism and a report includes country by country details of the languages in use, together with recommendations on educational policies to deal with the issues arising from linguistic diversity. This CD-Rom examines the place of intercultural competence in the language classroom, based on the example of the “Gulliver” Internet forum, with contributors from 23 classes in 22 different European countries. The impetus for the Gulliver project was the realisation that there will never be a truly united Europe without better mutual knowledge and understanding among its citizens. Language Across the Curriculum LAC, was one of four international networks set up at the ECML Workshop No. 4/97, held in Poland, entitled 'Foreign language teaching and learning in Central and Eastern Europe: Towards common principles for European foreign language curricula for children of age 9-11'. LAC represents an exciting new approach to foreign language learning at the primary and secondary level, whereby children learn a language simultaneously with other practical exercises i.e. learning a short song in a foreign language. The purpose of this text is to clarify the concepts of societal multilingualism and individual plurilingualism, in accordance with other texts of the Council of Europe, to describe the characteristics of plurilingual and intercultural education, to make clear the crucial importance of competence in languages with respect to educational and therefore social success so that, in a multipolar world, knowledge of languages is not reduced to the efficacy of linguistic communication. Aimed primarily at persons in charge of curricula, this Guide addresses all those involved in teaching. It offers practical approaches in curriculum development, illustrated with scenarios, in order to implement plurilingual and intercultural education. 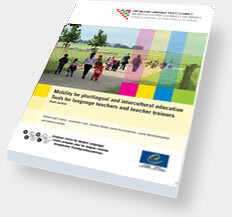 The QualiRom initiative has published an extensive databank of teaching and learning materials for teachers of Romani. The materials developed in six Romani varieties range from proficiency levels A1 to B2 for learners at primary, secondary and tertiary levels and constitute the largest resource of its kind for the teaching and learning of the Romani language based on European standards. The databank comprises 39 sets of materials (some 16,000 pages!) in Arlije, East Slovak, Finnish, Gurbet, Lovara and Kalderaš Romani. The following documents and tools are available in English and in Romani (Kalderash or Usary). This position paper was designed to guide and clarify the scope of the protection afforded to the Romani language under the European Charter for Regional or Minority Languages.